The University of Wisconsin–Madison is accredited by the Higher Learning Commission, 230 South Lasalle Street, Suite 7-500, Chicago, IL 60604, telephone 1-800-621-7440; www.hlcommission.org. UW–Madison, which was first accredited in 1913, was last accredited in 2009, and will go through a reaccreditation process again in 2018–19. Verify status here: https://pubs.wisc.edu/ug/geninfo_accreditation.htm . What are the entry requirements for the Online Master of Science in Clinical Nutrition? Apply to the UW-Madison Graduate School via the Madison Graduate School Electronic Application. Your application must include a statement on your reasons for applying; three letters of recommendation; TOEFL scores if applicable; and unofficial transcripts submitted through the Graduate Portal. 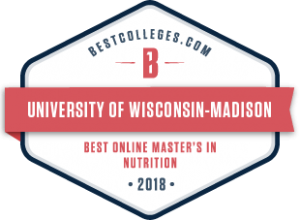 How many credits do I need to earn an Online Master’s of Science in Clinical Nutrition? How many hours should I commit to studying each week? While study needs vary from student to student, for graduate-level coursework, you should plan on studying at least three hours per credit hour (e.g. for a three-credit course, you will want to at least 9 hours per week). Will I be eligible to take the Registered Dietitian registration examination upon completion? The online Master’s of Science in Clinical Nutrition does not take the place of an ACEND-accredited Didactic Program in Dietetics (DPD). Do I need to come to UW-Madison for exams and/or projects? Is credit for life experience available? We do not offer credit for life experience. How long will it take to complete the Online Master of Science in Clinical Nutrition? You can complete this program in as little as one year, or you may choose to complete it at your own pace.